wont we already be fried by the sun then anyway? Being that the Earth is 4.5 billion years old, and Humans as a species have evolved only within the last hundredth of a percent of its lifetime, it would be far more probable we’ll have made it off this rock, evolved in to a form that can sustain increasing temperatures from either global warming or solar expansion, or (at the rate we’re going, most likely), extinct ourselves from the face of it well before then. However, such an event would be freaking amazing to behold! Far more probable than that scenario is where we humans will be fossils in rock layers. Some of our items will last a long time too. Probably the biggest longest lasting item we humans make will be the toilet. They will last billions of years. It is a fitting epitaph. Probably the biggest longest lasting item we humans make will be the toilet. […] It is a fitting epitaph. Well, at least it’s the one place where politicians know what they are doing! Carl Sagan said that the Last Good Day on earth was about 5 billion years away, before expanding Sol slowly heats its inner rocky planets in a slow-absorb as it swells into a red giant. Yep – Mother Earth is middle-aged ! The lower limit on the period before plants no longer can sustain oxygenating photosynthesis, and hence larger forms of complex life, has been quoted as 0.2 billion years. But most seems to quote 0.5 as the lower limit. Which means the current form of the biosphere, from the Great Oxygenation Event @ 2.5 billion years, takes ~ 0.5/((4.5-2.5) + 0.5) or 20 % of the whole at worst. That would mean Earth’s biosphere is retiring as we write. This figure might be debated some. I think the Earth’s orbit has been nudged outwards by the gravitation of Jupiter. So I think that .5 gets increased to up to somewhere between .7 to 1.2. This does mean that if the oceans boil in 700my that we are at 26% and if it is pushed off to 1.2 then it is 37%. It might be somewhere around 30%. The complex biosphere with forests and ecologies with large animals will probably take its first major hit in 300my. At this point the continents will recombine into PangeaII. Africa will ram into Europe and Middle East, North America will slam into Asia, and South America will continue to ram into North America. This will probably mean the dominant ecosystem will be deserts, with huge areas similar to the Sahara. Once the continents separate again there will be other extenuating circumstances, such as shrinking ocean area, increased solar heating and so forth. So this means that life may not recover its level of biodiversity and over time it will diminish. The time period from the Cretaceous to now and maybe a 100my into the future might represent the peak of bio-diversity. In 3.5 billion years Earth will probably resemble a somewhat less hot version of Venus. This probably will not be visible from Earth, for the atmosphere will probably end up opaque as that on Venus. This vista might be visible from Mars. With the warming up of the sun it might just be that if there is life on Mars that it might experience a sort of evolutionary renaissance. Seems Chicken Little was right after all! A bit off on the timing, tho. Wow! Just read the three arXiv papers 138-pages long! Yes, M33 may hit first, but what about our own satellite galaxies? – where will the Magellanic clouds be? The LMC and SMC were not included in the study, their combined mass is similar to that of M33 comprising ~10% of the Milky Way’s mass. 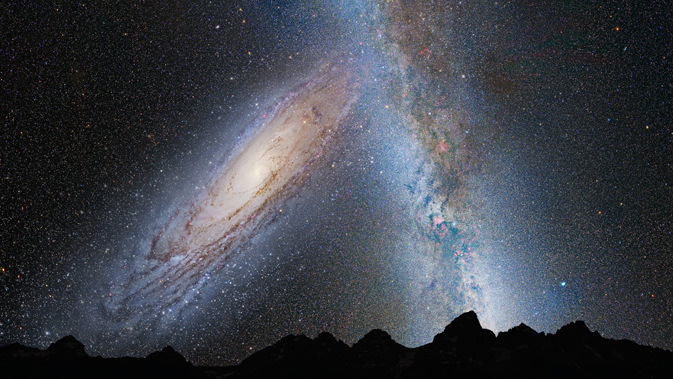 Their motion is away from the direction of merger towards M31. According to the authors their impact on the overall MW-M31-M33 System is therefore likely to be small. Too bad we won’t be alive then to see it all happen. If I could stay alive forever and wait 3.75 billion years to see it,the wait would’ve been worth it even though by that time the Sun will be near it’s end as well as most sunlike stars in the Universe. So be thankfull you’re alive at this point in time in the Universe where stars are forming and planets possibly with intelligent life are out there folks. Interesting how estimates for the time before collision has gone from 200 million to 2 billion to 4 billion years. … At least it has started to converge. I alway remember 2 billion years as the time for the galactic wreck. For some reason it is now 3.5 billion years. The difference between the 3rd and 4th images is unbelievable. I think 100 million years in galatic scale is too short for such a huge change. La verdad es que en cierto modo se puede decir que este estudio es erróneo, o cuando menos sus imágenes desde la tierra. Si tenemos en cuenta que a nuestro sol le quedan unos 4.000 millones de años y que dentro de 3.000 millones la tierra habrá sido engullida por la gigante roja resultante, es imposible pensar que nuestro sistema solar, tal y como hoy lo conocemos, mantenga la misma configuración. El sol, dentro de 4.000 millones de años no sera más que una nebulosa planetaria y su núcleo habrá quedado reducido a una enana blanca. la fuerza de atracción de nuestra estrella disminuirá permitiendo que los planetas exteriores se pierdan en el espacio. Pero es que la materia que se desprenda desde el sol podría alcanzar una distancia de varios años luz, llegando casi a Alpha Centauri, cualquier movimiento de astros dentro de este rango e incluso mayor, podría causar la dispersión de esta nebulosa o simplemente deformarla. Esta sucesión de imágenes esta bien para el imaginario colectivo, pero faltan datos. The truth is that somehow we can say that this study is wrong, or at least their images from Earth. If we consider that our sun has left some 4,000 million years and that within 3,000 million earth will be engulfed by the resulting red giant, it is impossible to think that our solar system as we know it, keep the same configuration. The sun, within 4,000 million years will not be more than a planetary nebula and its nucleus will have been reduced to a white dwarf. the attraction of our star will decrease allowing the outer planets are lost in space. But is that matter which it is clear from the sun could reach a distance of several light years, almost to Alpha Centauri, any movement of stars within this range and even higher, may cause the spread of this nebula or simply distort it. This sequence of images is good for the collective imagination, but data are lacking. Wouldn’t it be incredible to be here when all of this happens but wouldn’t our own Sun being expanding and perhaps finishing us off by then? Didn’t Tom Lehrer say ‘ we’ll all fry together when we fry’ in one of his many magnificent songs? In 7 billion years astronomers will be out of a job wherever they are in the galaxy. There is no way light pollution laws are going to save the night sky when the galactic cores merge and create a permanent night-time glow.